To crib from Sinead O'Connor, nothing compares to The Sims. It's the bestselling PC gaming series ever. It's also kind of a paradox. You don't shoot guns. You're not fending off an alien invasion. The hellmouth hasn't cracked open, leading to Mars or Silent Hill or wherever. And after two installments and oodles of expansions, it's about to lure us back for thirds: The Sims 3 ships for Windows and OS X systems next Tuesday, June 2nd. The Sims 3 executive producer Ben Bell phoned me earlier to chat about the franchise, his favorite features in the new game, and how it's pioneered online self-expression and creative content exchange. Game On: The Sims, as most know, is a massive franchise, the most popular PC game series ever, with over 100 million units sold since February 2000. Why do you think it's done so well? Ben Bell: The Sims is a game that lets you create people. You can customize what they look like, and control their lives and decide what they do. The reason I think that's so interesting for people is because the game immediately reflects who you are as a person when you're playing it. The game has very open-ended goals. As a controller of people, as a controller of life, you get to decide what you're trying to do with the game. You can help your characters get ahead in life, you can play dirty tricks on them, you can recreate situations from your own life with the game. So immediately as you start to play with it, it becomes a reflection of you, and I think that's really appealing to people. It inspires creativity as you're playing, so it's a piece of entertainment, but it also becomes like a diary. 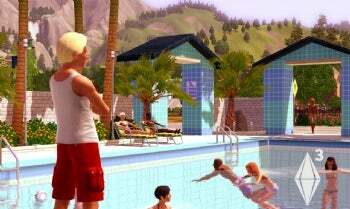 GO: Let's walk through a few of The Sims 3's new elements. What's Ben Bell's favorite feature? BB: My favorite new feature is definitely the trait system, for two reasons. Number one, I feel that the promise of being able to recreate people is exciting, but we sort of complete the promise by giving you the ability to create real people with real personalities. In The Sims 3, you can create a person and give them different personality traits. You select from a very long list of traits, there are in fact over 60 of them, and you describe who you want your characters in the game to be and then they behave accordingly. For instance, if you want your character to be artistic, they'll decide that they want to paint and they'll be really good at it, or they'll be interested in writing books, and so on. Whereas if you decide you want your character to be evil, they'll be really happy when bad things happen to the people around them. So I really like the idea of traits, but secondly, I'm particularly happy with the way we executed the idea. Every trait has several dimensions to it, so the traits determine not only what the Sims want from life, but how they relate to other people, how they use things in the world, what they're capable of in life, and so on. It's really rich, it's really deep, and it's very believable. GO: Can you comment on where you landed between the tactical and strategic Sims management layers? BB: One of our guiding principles when we were designing the game was that we wanted the game to feel like exactly whatever you were interested in, that is was about your story, the things you were trying to do with your characters. To fulfill that promise, we made it so that the Sims are more intelligent now than they've been in the past. So they're more capable of taking care of themselves. Let's say you just wanted to be an observer of the game, that you wanted to see how the personality traits manifest. You could take your hands off the controls and just watch, and the Sims will take care of themselves. They'll act according to their personality traits and develop relationships and so on. But the moment you pick up and play one of the Sims, if you sort of think of the Sims as toys, the moment you start to play with one of them, you'll get to look at what they want. They all have individual wishes, so you can see what some person is thinking about and what they want based on the things that are happening around them, who they are, and where they're at in life. You can really start to dive deep on those wishes, and help them fulfill every single one. It should feel like you get to shine the light wherever you want, and you don't have to stop looking at something if you're not interested in anything else. GO: You've made customization a central tenet this time, letting users toggle just about anything, from aging to death. BB: It's such a big game, and people have so many different ideas about what they want to do, so we felt like it was really important to enable everybody to do what they wanted. It's a simulation of life, so some people are interested in seeing what it's like to evolve many generations of a family, whereas some people just want to focus on a single character and develop that character's story extensively. We wanted to give people all of the widgets and dials that we could, for them to create their scenarios. You don't have to mess with any of that stuff. If you just want to play the game as we designed it, it's there for you to jump right in, and there are certainly lots of short term goals that you can achieve. But if you really feel like you want to retell the history of your family, or of some character that you're working on in your novel, or all of the people that you work with in real life, you can set up the game to do that. BB: There were ghosts in the past, but we thought it'd be fun to make them playable characters this time around, so that if somebody passes away in the game, which happens, unfortunately, you can take them over as a playable character and they'll be this fun, interesting thing to play with. GO: The Sims 3 is actually a prequel of sorts, right? Is it also an alternate timeline? Will Romulans and Vulcans come shooting out of a black hole at startup? BB: We took some of the characters who appeared in past games and we created earlier versions of them. That was more of a nod to our fans who've followed the series. But The Sims isn't really about those characters. They're background for your character, and while you can play as these unique characters we've created and dropped into the town, you can also choose to replace any of them with people that you know, your favorite TV character, your favorite sports heroes, whatever it is. We definitely wanted to use personality traits to say something funny about the classic characters that everybody knows from The Sims and The Sims 2, but I wouldn't read it as a prequel. The story is there for you to carry on.